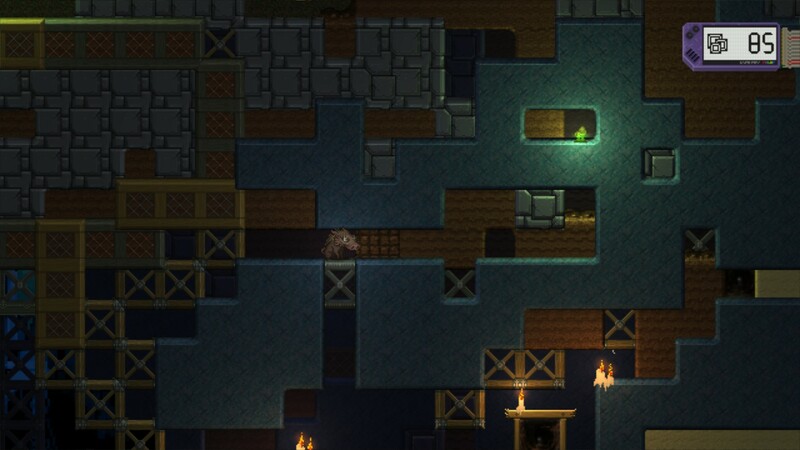 In Full Bore, you control a boar as you explore a pixelated and puzzle-filled environment. I had a good feeling right from the start about Full Bore, since the first thing the player is tasked with is choosing between playing a female or male boar. This has no effect whatsoever on the game, but it shows the developers are cognizant that not all players are male, and would perhaps like to control Hildi rather than Frederick. A nice touch! 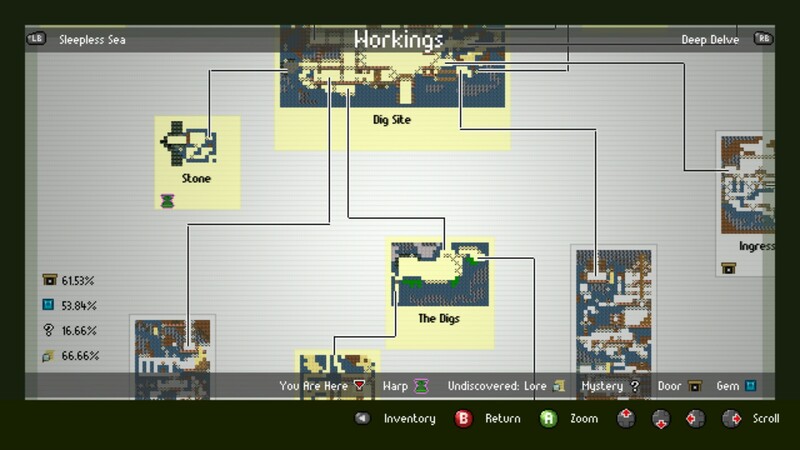 The game consists of solving puzzles in order to explore the game world, which in turn advances the plot and reveals more background information about the world. Though the game looks like a platformer, the boar you play is unable to jump, which greatly complicates how you navigate the world and makes exploring feel different from other visually similar games. Also, it seems like it might be a Metroidvania type game (it’s about exploration, it has puzzles, pixel graphics, etc), but it’s totally not, and maybe confusingly so. In most games like this, as you explore you come across things you can’t get past, and you return later when you have the right tool. In Full Bore, you never get new abilities and can solve most everything as soon as you come across it. I wish this had been made explicit somehow, since I skipped things thinking “Can’t solve that, maybe I need some doohickey I’ll get later.” It seems silly, but if you’re breaking a central trope of the genre you’re in, I think it’s wise to signal that to the player somehow. Full Bore’s story uses a parallel structure of the player advancing the plot Hildi is experiencing while simultaneously letting the player learn more about the backstory. It’s not an original structure, but it’s used in so many adventure games because it works so well. Thematically, I also liked the line it walks between magic and technology: It’s a post-apocalyptic setting with sci-fi elements, but with some mysterious magic-y elements. It’s a great deal heavier, storywise, than the light visual style might imply. It reminded me of Adventure Time in both those respects. I found the backstory elements interesting, and loved whenever I came across a new Exposition Dispenser (notes, books, computer consoles, etc). The plot in the present is pretty weak by comparison: it begins as a throwaway premise to solve puzzles (getting gems), grows into a series of weak justifications to get you to go from one place to another, and eventually picks up into something more interesting as you go along. The story in the present also comes to loop in the backstory elements as well, of course. Also, I adored the moments in which the story unfolds through purely visual scenes- Full Bore is at times content to show, not tell, and storytelling without words like that is impressive. There’s some dissonance between the themes of the story and its cute talking animal characters, which while used for dramatic effect or humor in the aforementioned Adventure Time, here seems to just lean too heavily on the player’s suspension of disbelief. I thought the weight of something heavy like mankind’s extinction was undercut by the cute talking pigs, though not ruinously so. Call me jaded, I guess. The puzzle elements of the game are essentially a twist on the age-old Sokoban, which is a conceptually deep well many designers draw from. Since you’re unable to jump, and can only move horizontally or diagonally up, the puzzles consist of pushing and destroying blocks to reach objectives. There are different types of blocks which behave differently to being pushed or destroyed, and introducing new block types as you advance is how the game compensates for the limited novelty of the underlying puzzle. Since every puzzle can be reduced to a series of branching decision paths, they can usually be solved via a search tree approach (“Ok, first I have to do this, then I can do this or that, so I’ll try this first, then…”). Occasionally the puzzle elements interact a novel and unforeseen way, and those rare moments provide great “A ha!” solutions. While there were some that I felt super smart for completing, I more often felt they were either much too easy and therefore tedious, or far too difficult and thus frustrating. No puzzle game can please everyone since people have different aptitudes, but on the whole I think I’m dumber than the intended audience and found myself giving up frequently. Also, while most puzzles can be approached very leisurely and contemplatively, there were occasional aberrations that required running and quick reflexes, which I found unwelcome and out of place. 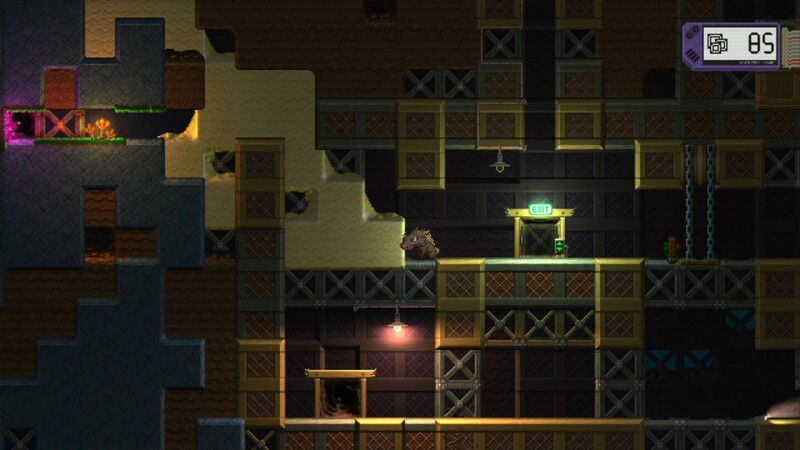 Whereas an abstract puzzle game can have “levels”, Full Bore has a game world you explore to encounter puzzles. This is a bit of a mixed bag. Navigation is aided, somewhat, by a map and warp gate system (which has a great narrative payoff), but I found navigating the game world to be a chore when you needed to get somewhere specific. Exploring felt great, and the game has lots of tucked away areas to reward looking around. But getting from A to B, perhaps to backtrack to try an earlier puzzle, was painful. The two mechanics here, puzzle-solving and exploration, are too much in conflict: when you want to solve a given puzzle, getting there is frustrating, and when you want to explore, an intractable puzzle can prevent progress. Especially for some of the larger areas, trying to find a puzzle you might have missed was far too annoying for my tastes, and I was more likely to just skip them rather than try to find my way back through the twisty map system. Full Bore has a great faux-retro pixel style. In contrast to Wizorb, which used a very traditional pixel art approach, Full Bore has a more modern take. It’s pixel art, but not obsessively so, as it uses modern lighting, shading, and animation techniques. I found the art style visually engaging and it was used consistently to accentuate the narrative themes. So levels are bright and cheerful where appropriate, but at other times moody and foreboding. The game really benefits from such a well executed mise-en-scène. This atmosphere is assisted in turn by the music, which is really top-notch. I think music in games only rarely rises above the level of “Is not a nuissance and provides aural cues to the player”, but Full Bore’s does a wonderful job. The music is enjoyable in its own right (a sort of ecclectic mix of musical styles that creates a unique feel), but each track was well tailored to the accompanying levels. The quality of the compositions is such that it even excuses that the band who created them has the ludicrously sophomoric name of ‘The Adjective Plural Noun’. Get it, get it? Like all band names are always… ah, nevermind. If you’ll accept the reductive premise of looking at a game’s narrative, audiovisual style and mechanics separately and on their own merits, let’s now look at how these elements work in concert. On the whole, I think Full Bore’s elements come together very cleanly. The narrative themes concern science and exploration and delving too deeply, and the mechanics too are about puzzle solving and exploring, and the art and music bolster both these fronts- so far so good. During its best moments, Full Bore really is something special; atmospheric, fostering a sense of discovery, and making the player feel a part of an interesting experience in both imagination and practice. That’s difficult to pull off! Solving puzzles to open up new areas isn’t a new idea, but it’s used effectively, and the artwork and writing ensure you want to keep exploring. Technically, there’s nothing about pushing blocks around that relates to the narrative (in the same way that, as an example, Braid’s puzzles are directly linked to its theme), but its an original spin on block-pushing and it works well enough, and it does reinforce the largely subterranean setting, I suppose. The nominal objective for solving most puzzles is to get a gem. Why do we want those, in-universe? For some handwaved reason that doesn’t matter. I had the most fun solving puzzles where the objective was a doorway. The reward was getting to see somewhere new. I solved puzzles to get gems because, mechanically, that’s what the game asks me to do. I think either having the puzzle objective matter in some meaningful narrative way would be an improvement, or, having all puzzles lead to doorways. That might not be feasible practicably speaking, but it’d create a stronger convolution between story and game. To the immediate right of Hildi are dirt and stone blocks you can destroy/move, but that path does not lead anywhere. Above her, past the blue material, are more dirt and stone blocks, but those cannot be interacted with, they’re just scenery. To the lower right are dirt and sand that do lead somewhere. 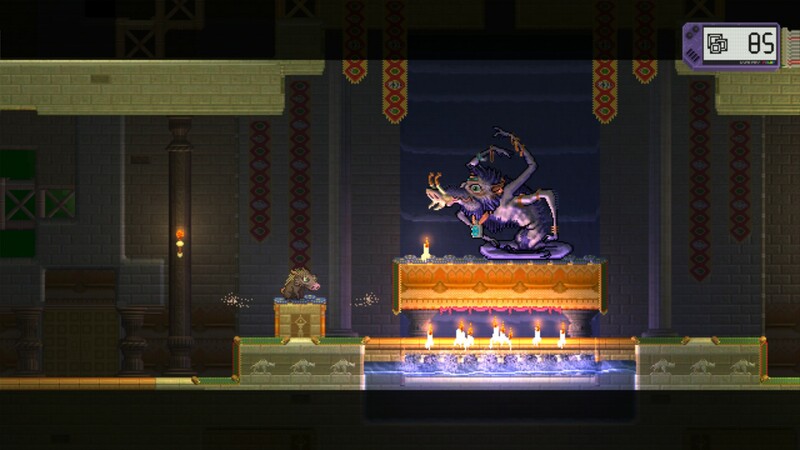 The use of puzzle-blocks, so to speak, as background-blocks creates interesting and consistent visuals, and each level was designed with obvious artistic care. But mechanically, it’s maddening! It’s never clear if something is part of a puzzle, or just background, or if maybe it’s background for now but later you’ll find some other way to get there. I really love that the world that exists narratively is the same one we solve puzzles in, but having ‘puzzle-blocks’ the player can never touch seems like a design misstep. Lastly, I think there’s some ludo-ludo dissonance, so to speak, as well. Mechanically, we solve puzzles and explore an environment. When things are going well, this works great- you solve some puzzles, see new places, good time to be a boar. But when you get stuck on a hard puzzle (which as I said, happened to me frequently), the best thing to do is to step away from the game. I found whenever I came back later, I’d approach the puzzle in a new way and solve it. But that had interrupted the sense of exploration, and I had forgotten where I was or what I was doing. Puzzles and Exploration are great together when they’re both perfect, but if either are anything short of that they really detract from each other. For a first-time game from a young studio, I think Full Bore is really solid. I’m able to nitpick some faults largely because the game is so charming overall (…and also because I’m great at nitpicking), and it’s a great example of how the mechanic and narrative elements of a game can come together for a better whole. Also, the mole people were cute.